This post is part of Sci-Fi Month 2015, a month long event to celebrate science fiction hosted by myself and Over the Effing Rainbow. You can view the schedule here, follow the event on Twitter via the official @SciFiMonth Twitter account, or the hashtag #RRSciFiMonth. A common trope of science fiction is to show the Earth greatly transformed, or even completely destroyed, in some way. Our poor planet has been used and abused throughout the history of the genre. Here’s a brief guide to the (post-)apocalypse, or dystopian future, covering books, TV, films and video games. In these titles, Earth is either destroyed or invaded by aliens. In the latter, it is altered to a state where it is unrecognisable: either through the collapse of society and government, or destruction of large portions of the planet. Sometimes the extra-terrestrials are aggressive, sometimes they are just inquisitive, and other times we’re not even aware of them until it is too late. Mass Effect, The 5th Wave, Defiance, The War of the Worlds (plus the 2005 film version), Independence Day, The Day of the Triffids, The Midwich Cuckoos. These titles show an Earth ravaged by illness, disease or plague, including technological viruses and biological warfare. In many of them, the illness transforms humankind into something else, often zombie or vampire-like creatures. The Passage, Blindness, Oryx and Crake, Partials, Parasite, I Am Legend, The Stand, Children of Men, The Strain. Science fiction frequently shows how humankind causes its own downfall, often through war or revolt. This is a particularly popular theme in current Young Adult dystopian fiction, although it’s not exactly a new trend in the genre. This is one of the more frightening sides of sci-fi: how we become our very own worst enemies. Occasionally, it shows a glimpse into an alternate future or past. The Hunger Games, Divergent, The 100, The Years of Rice and Salt, Unwind, The Man in the High Castle, How I Live Now, A Canticle for Leibowitz. This could also technically come under ‘Humankind’, because most of the time the natural disasters are caused by people, namely through global warming and climate change. This category includes these as well as other things such as asteroids/meteors, tsunamis, earthquakes etc. 2012, The Day After Tomorrow, The Maze Runner, Deep Impact, Armageddon, The Drowned World. Another terrifying thing about science fiction is how government is often portrayed. Often it is shown as being a totalitarian or ‘Big Brother’ society, a term coined from George Orwell’s 1984. Citizens often have very little freedom, or even free will, having been brainwashed into behaving in certain ways. 1984, Brave New World, Fahrenheit 451, Atlas Shrugged, V for Vendetta. Okay, maybe there’s a lot of scary things about science fiction – another one being the very thought of the Earth being overrun or overtaken by machines or artificial intelligence. Many a sci-fi tale tells of the invention of some fantastic new technology, only for it to become sentient and rise up against mankind. I, Robot, Robopocalypse, Do Androids Dream Of Electric Sheep?, Love In the Age of Mechanical Reproduction, Prey, Neuromancer. Can you think of any other titles that would fit in these categories, or any categories that I have missed? Prose & Pixels is a feature that combines two of my loves: books and video games. Here I’ll discuss all sorts of things to do with the two, whether it’s recommendations, influences or just a good old chat. Today I want to discuss the bookish influences on the Bioshock series of video games. If you follow my Twitter feed, you may have recently seen me talking about a game called Bioshock, and how I was terrifying myself by playing it with headphones and in the dark. Although it had me screaming, swearing and shrieking, it also got me thinking. There is an obvious bookish influence on the game – the imagery within, as well as some of the character names, instantly made me think of Ayn Rand’s Atlas Shrugged. So of course I had to do a little research into it, and yes – it’s a big influence, along with many other books. Set in 1960, Bioshock follows a man named Jack, who ends up in the ocean after his plane crashes. After heading towards a nearby lighthouse, he finds a bathysphere, which takes him to the underwater city of Rapture. Intended to be a utopia by its founder Andrew Ryan, Rapture unfortunately took a turn in the opposite direction with the discovery of ADAM – a plasmid that gives the user superhuman powers. The city is now filled with addicts and horribly transformed people, including the terrifying Big Daddies. Jack has no choice but to fight his way through the city, with the help of a man named Atlas, using plasmids, weapons and the very environment of Rapture itself. One of the most obvious bookish influences here is the idea of utopia and dystopia. So many times in fiction, we’ve seen a seemingly perfect society peel back its shiny exterior to reveal something cold and very, very horrifying at the centre. And Bioshock is exactly like that. The environments are beautiful, Rapture’s art deco and 1950’s style is pretty breathtaking. Combine that with an underwater setting, where you can play around with water, light and reflections and it really does look like a utopia. I mean, just look at some of the concept art! At first glance, Rapture looks beautiful. Neon signs, specially crafted underwater gardens, the city neatly divided into sections, entertainment districts – but soon you start to notice the graffiti. You see the blood on the walls, the smashed and ruined windows and belongings. Then the bodies begin to appear, and soon you hear the noises. A high pitched, maniacal laugh. Something running along the ceiling. A long, low groan. Stomping of heavy boots. A young girl whispering to herself (or someone? ), whispering things that a young girl shouldn’t even know about. And that’s when you realise – this is DEFINITELY no utopia. As well as this statue, there is also the mysterious character of Atlas, an Irishman who guides Jack through the halls of Rapture, and the character Frank Fontaine – the name perhaps inspired by Rand’s The Fountainhead? Perhaps a simpler comparison is that Andrew Ryan is an anagram (albeit with a few extra letters) of Ayn Rand, and that many events throughout the story of Bioshock echo that of Atlas Shrugged. It’s not just Ayn Rand’s work that influenced Bioshock. The Garden of Eden was the original utopia, ruined by the actions of Adam and Eve. Similarly, the actions of man (and woman) have ruined the utopia of Rapture. Although ADAM can grant the superhuman powers, a drug called EVE is needed to keep the plasmids active. Not only this, but the very word ‘Rapture’ conjures up Christian imagery: of the ‘good people’ of the world being taken away to a better place. Rapture may have been that place but for, rather ironically, the use of ADAM and EVE. One other book that was immediately brought to mind by the events of Bioshock was Frankenstein by Mary Shelley. Some of the toughest enemies in the game are called ‘Big Daddies’, which may not sound menacing but they are TERRIFYING. You’ll first know of them when you hear a low groan, and heavy stomping. You might also hear the accompanying Little Sister. The stomps will grow louder as they get closer, and the ground will shake. And it may look slow – but once it spots you or you try to hurt the Little Sister, it really isn’t. Big Daddies were originally human beings, genetically enhanced and with their skin and organs grafted onto an antique diving suit. I mean, that’s enough to make anybody mad, right? After the process, they are unable to make any noise but a low groan, similar to a whale call. Their original purpose was actually for construction work. However, when the Little Sisters (genetically altered young girls) were sent to collect ADAM from the corpses of Rapture, the Big Daddies were sent to protect them. The whole idea of creating new life and playing around with genetics really reminds me of Frankenstein, and the Big Daddies are definitely monsters. And like Frankenstein’s Monster, the Big Daddy also has something he wants to protect. The creators of Bioshock have also claimed that both 1984 by George Orwell and Logan’s Run by William F. Nolan were influences, in that way that the interesting societies in both books were ruined by their creators, humankind. Have you played any of the Bioshock games? Are there any other books that you think influenced the series? 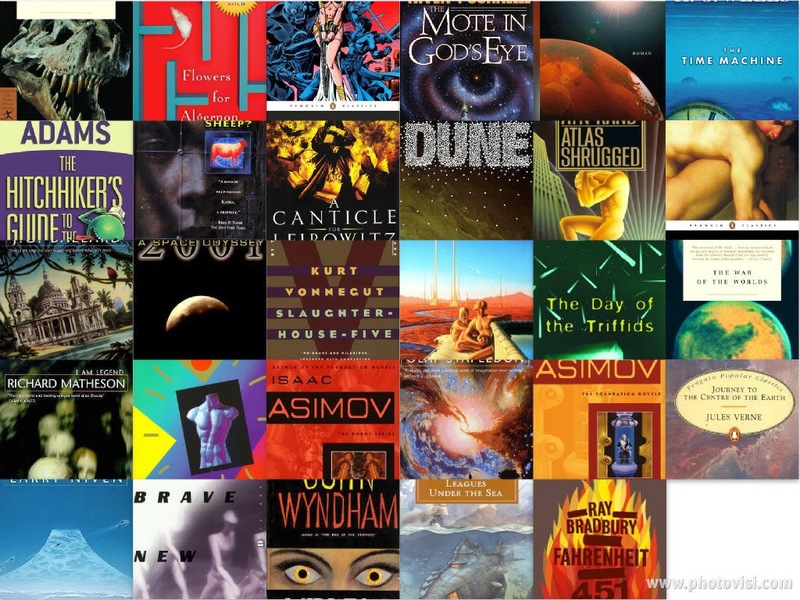 Today I want to share a challenge with you all: my definitive list of science fiction reads! They are books I feel every sci-fi fan should read at least once in their lifetime, and as well as creating a challenge for myself I hope that it can be challenge for some of you too. Although I already have a Top Sci-Fi and Fantasy Books Challenge, I wanted to create one that reflected all different types of science fiction, including Young Adult. So it will actually be a mix of books I’ve loved, books I really feel I should read because they’re considered classics, and some titles that might often be overlooked, as well as some books that I’ve heard a lot of good things about. If you’d like to join in, feel free! I’ll be keeping track of my progress too, on a separate post. Don’t forget to check out the schedule for the rest of today’s posts. You can also Tweet about the event using the hashtag #RRSciFiMonth. What do you think of the challenge? Are you going to join in?